During this past week, I have been working on two projects to satisfy my curiosity. One of those projects was to find and document all of the coins the U.S. Mint has produced for foreign governments. One of the questions I wanted to be answered was what was the first coin the U.S. Mint produced that was not for the United States and what was the last. Finding most of the information was easy. 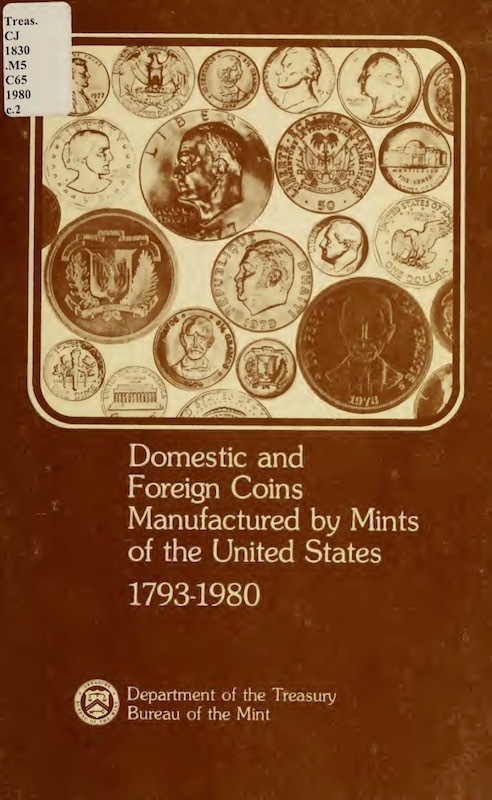 After searching a number of online archives and digitized publications, especially the Newman Numismatic Portal hosted at Washington University in St. Louis, most of what I was looking for was printed in the publication Domestic and Foreign Coins Manufactured by the Mints of the United States. Although I have a printed copy, it would be easier if someone else digitized the book. After poking around a few archives, I found a digital copy and downloaded the entire image as a PDF. Although other formats were available, the PDF image was the most complete and the only one that my optical character recognition (OCR) program was successful in converting the printed page to something a computer can understand. These printed tables have been updated ever since the Bureau of the Mint began to publish this compilation, which appears to begin around 1905. Prior, bits and pieces have been added to the Director’s report which was submitted to congress as part of a larger report by the Department of the Treasury. The problem is that the tables were created in a matter that would be easier to typeset using the technology of the time. It is not optimal for the person that wants to digitize the information. I will spare the details, but it took more than two weeks of part-time work to extract the data and format it in a way that made sense for a computer. Even though I felt that it might have been faster to manually transcribe the data, the work will benefit future projects. Not coincidentally, the last time the Mint published this book was in 1980, the last year they stopped striking accepting orders to strike coins for foreign countries. The first coins struck by the Mint for a foreign government was the 1876 one centavo and 2½ centavo coins for Venezuela. In 1875, the Mint in Philadelphia struck 8 million of the one centavo and 1.5 million 2½ centavos coins for Venezuela. The composition is reported as being an alloy of copper, nickel, and zinc but there is no record of the ratio. Apparently, it was common for the Mint to strike coins for foreign countries with the following year’s date. In one document, it explained that these coins were struck at the end of the year following the completion of the minting of United States coins. Since coin production and transportation was a bit slower than it is today, it allowed foreign governments to plan for their following year’s demand. 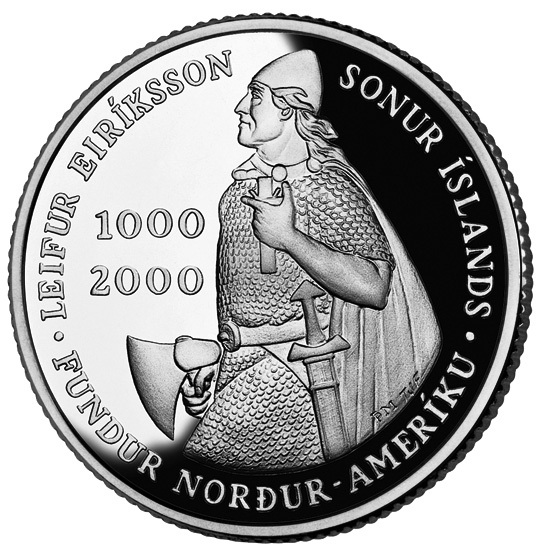 The last coin produced for a foreign country was the 2000-W Leif Ericsson 1000 Krónur silver coin produced for Iceland as part of the Leif Ericsson commemorative issued in the United States. The last circulating coins the Mint produced for foreign governments were coins for the Dominican Republic and Panama in 1980. One thing that none of these tables include are the coins struck at the Manila Mint. To help relieve the burden of making coins for the Philippines after they became a colony of the United States, the Mint was allowed to establish a branch mint in Manila. It is the only branch mint outside of the continental United States. The mint opened in 1920 and produced coins in one, five, ten, twenty, and fifty-centavo denominations. Coins struck by this mint bear either the “M” mintmark or no mintmark. The mint was closed in 1941 because of the outbreak of war. Official records from the Manila Mint are difficult to find because they were not included in the regular Treasury reports. Using a combination of the colonial government reports to congress, which required a trip to the Library of Congress, and the Standard Catalog of World Coins, I was able to compile the data of coins produced in Manila. When the table is completed and I figure out a way to display the data in a useful form, I will upload it for everyone to reference. I know that there will be some that would disagree with adding the mintage from the Manila Mint to those located in the United States. But the Manila Mint was owned by the United States government at a time that the Philippines was a colony of the United States and was run by administrators that were part of the Mint’s reporting structure. As the editor of the data, that is enough reason for me to include it with the rest of the data of foreign coins produced by the U.S. Mint. Venezuelan coin images courtesy of Monedas de Venezuela. 2000 Leif Ericsson Krónur Proof coin image courtesy of the U.S. Mint. There are times that while we are having fun collecting coins, currency, exonumia, and the like, there is a real world out there with real issues. For some, this hobby can be an escape from that reality. On Wednesday, the Bank of England announced that they were looking into the issue where their new polymer notes contain traces of tallow. According to the supplier of the pellets that are used to make the polymer substrate, tallow is used in the resin it sources from a supplier to make those polymer pellets. It was a low-key response to an issue that was made bigger by the British vegan community. While writing a snarky response, my Twitter feed blew up with the news of the attack on the Westminster Bridge and near Parliament Square in London. I stopped writing and turned on the news. Having once walked on that bridge there was a sinking feeling I could not shake. MI5, the United Kingdom’s internal security force, arrested seven men and four women on terrorism charges. One of the women posted bail, the other 10 are still in custody. They have collected over 2,700 pieces of evidence that they will be studying. Although I am not a “run-and-hide” type, I find it difficult to be snarky given the recent events, even if the story deserves that type of treatment. I am sure that the heartbreak of tallow will return to the news and will give me a chance to have fun at their expense. But for now, let’s wish the best for the people who were injured and the families of those who are mourning. Image courtesy of the Government of London. A few weekends ago, I was out picking when someone offered to sell a box of lapel pins and buttons. Most of the buttons were modern political mainly from the 1988 election through the 2008 election. There was a mix of both major parties along with a number of local and state races, primarily from Virginia. The box was nothing remarkable. It was originally for high-priced basketball shoes from a well-known company in the western United States. Alongside many of the political buttons were lapel pins and some sports pins. I also noticed some buttons with cute sayings. While being stuck in the fingers I was thinking that I could buy the box and use it as junk filler at a show. Just like coin dealers have junk boxes, those of us in other collectible areas have our versions of junk boxes. In this case, I can lay them out in felt-lined trays and let buyers pick over them for a dollar each. Flag and ribbon pins always sell. So do buttons that say, “I usually don’t wake up grumpy, I sometimes let him sleep.” This gets the ladies to laugh and look at some of my other items. After setting up the card table I use to work on this type of sorting, I dumped the box in the middle of the table. Expecting to have to sort through a few hundred pins and buttons when I noticed a 2×2 flip on top of the pile. It was a coin sitting that was sitting in the bottom of the box now at the top of the list of things to look at. At first glance, I noticed it was not a U.S. coin and thought that it just could be an uncirculated copper-nickel coin until I looked closer. Shifting my glasses to get a better view there was no mistaking the reverse design as a Mexican Liberatad. 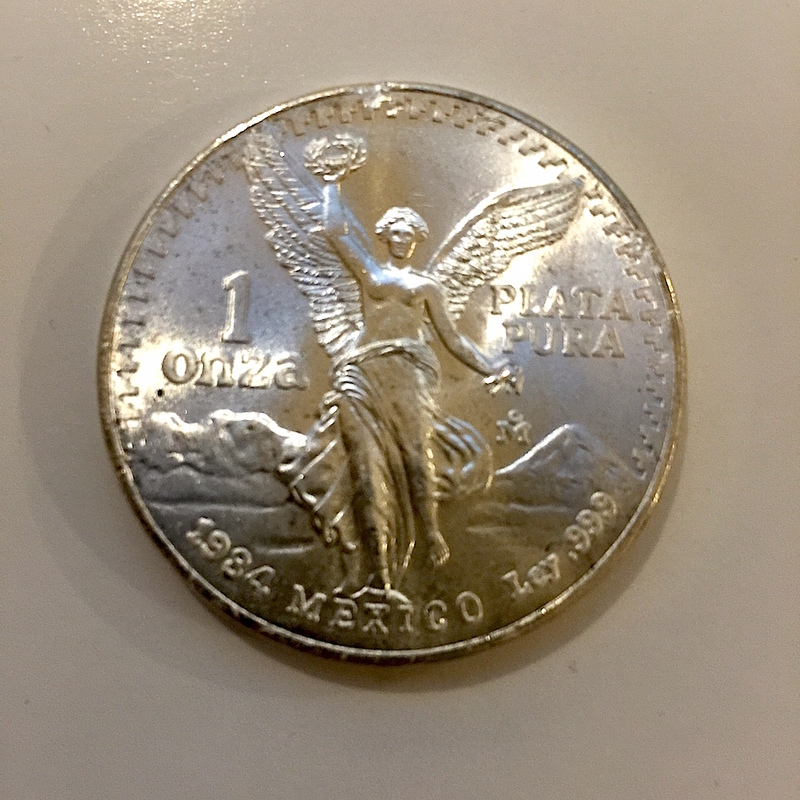 The 1984 Libertad is clearly marked “1 ONZA PLATA PURA” (1-ounce pure silver) with the obverse declaring it from “ESTADOS UNIDOS MEXICANOS” (United States of Mexico). I found a beautiful, uncirculated 1984 Mexico Libertad worth more than what I paid for the box! Although I love large silver coins, I have never owned a Libertad. Did you know that the edge of the Libertad has edge lettering? It reads “INDEPENDENCIA Y LIBERTAD” (Independence and Freedom). 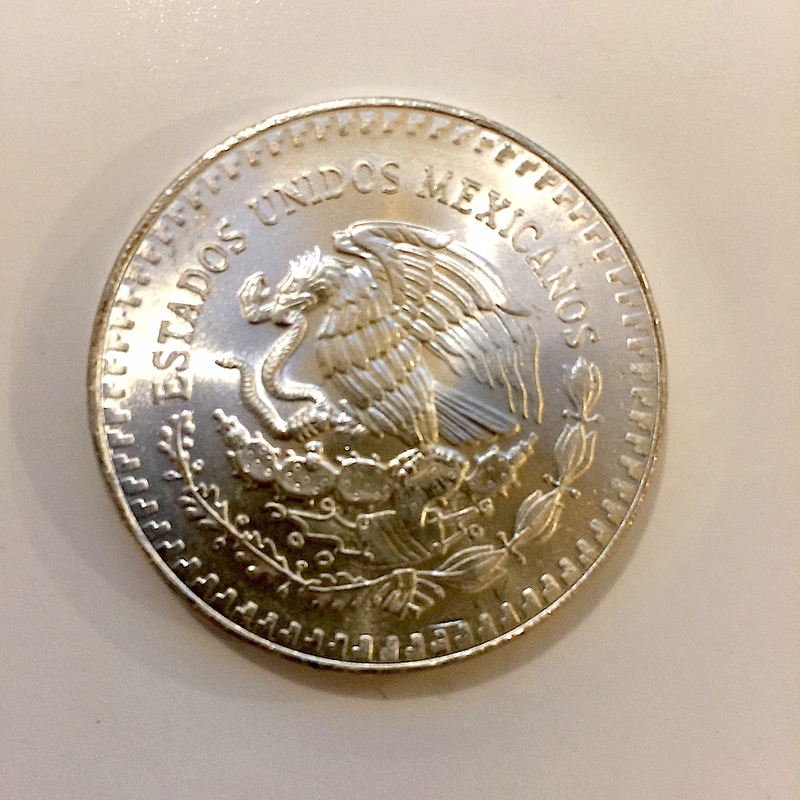 The distinctive mintmark of the Mexico Mint is on the reverse and has an overall great look. I almost did not buy the box! I admit to being fascinated by space and space travel. This has to go back to my watching the Mercury and Apollo missions as a youngster. Even then, I would watch most television shows that were based on space or something about space including the comedies Lost in Space and My Favorite Martian. During its first run, I was able to watch Star Trek during its last season. When it was picked up in syndication and played on the independent television stations or late at night, I would watch and become a bigger fan. In college, it was common to walk into the TV Lounge to see the television tuned to Star Trek, especially late at night. When Star Trek: The Motion Picture was released in 1979, I was able to see it during my December break from college. No, it wasn’t the best of the movies, but it was Star Trek. I was a fan of Star Trek: The Next Generation and I have seen all of the movies except the most recent—which I will catch when it is available on cable! Aside from being great stories, Star Trek has inspired generations. Look at the technology that is in use today. Cell phones were inspired by the communicators; the ship’s computer with its infinite database processing is now in supercomputers of today, like IBM’s Watson; while Majel Barrett was the voice of the first computer, we now have Siri, Cortana and Alexa on portable devices; large flat screen displays are now our television; intelligent personal assistants went from the personal digital assistant (PDA) to being integrated with our computer that can now speak to us; then there is the universal translator; tablet computers; video conferencing; even something like Transparent Aluminum (Star Trek IV: The Voyage Home) exists in something called aluminum oxynitride (ALON). And remember, Scotty gave the formula for transparent aluminum using a quaint keyboard on a Macintosh! Yes, I am a hard-core fan. But I have never been to a convention! I never really wanted to go. I did meet William Shatner when I was working for NBC, but that is another story for another time. The Royal Canadian Mint has produced a set of coins for Star Trek fans. As part of the series, the Royal Canadian Mint produced three half-ounce silver coins with enameled images of Spock, Uhura, and Scotty; one ounce coins with images of iconic scenes: Captain Kirk in “Trouble with Tribbles,” the evil Spock and Dr. McCoy in “Mirror, Mirror,” and the time machines image that was in “The City on the Edge of Forever” which featured a guest appearance by Joan Collins. They are nice coins even though they are enameled. However, I think they are too expensive. It’s probably because of the licensing fees. Of course, I had to get something. 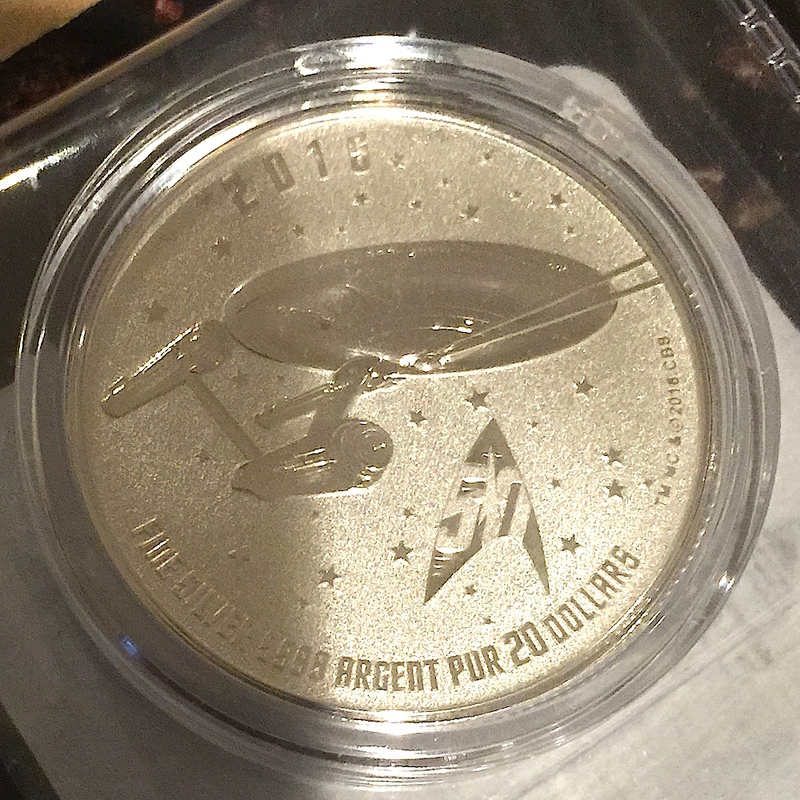 I decided to buy the $20 for $20 silver coin, Star Trek: Enterprise. It is a 7.96-gram silver coin with a face value of $20 with the reverse showing an image of the U.S.S. Enterprise and the Star Trek 50th Anniversary logo. The obverse has the portrait of Queen Elizabeth II, as required for all Canadian coins. While the RCM calls the finish “specimen,” it resembles a reverse proof. Not only is this $20 in Canadian funds, which is $15.22 in US funds as I type this, but there is also free shipping! I also decided to buy was the stamp and coin set produced jointly with the RCM and Canada Post. The set includes a nickel-plated steel 25-cent coin with an engraved center surrounded by enamel ring with six different views of the U.S.S. Enterprise (NCC-1701). The stamp features Canadian-born actor William Shatner as Captain James T. Kirk with the U.S.S. Enterprise orbiting a red-colored planet in the background. Also included is a coil stamp produced as a collectible sheet featuring the U.S.S. Enterprise and a Klingon D7-class battle cruiser from the episode Day of the Dove. You can buy the set from the RCM for $34.95 in Canadian funds, which is $26.60 in US dollars. If you buy the stamp and coin set separately, you will pay postage. However, if you buy both coins together, the RCM picks up the postage. Before I forget, the Royal Canadian Mint will only ship directly to addresses in Canada and the United States. Collectors in other countries will have to contact a dealer. A few weeks ago I wrote about the potential effects of Brexit on markets should the Brits vote to leave the European Union. When the OUT vote won by a slim margin, there was an instant worldwide reaction. In the subsequent weeks, we have seen world markets react to everything. After an initial fall in markets because of Brexit they have recovered only to be sent back into uncertainty with world events. The London PM Gold Fix was $1,265.12 before the polls closed on June 23. The next day, the London PM Gold Fix closed at $1,315.50 (4-percent increase). On July 15, the PM Gold Fix closed at $1,327.00, 4.9-percent increase since the vote. Experts are saying gold could continue to climb at the 4-percent rate for the near future. Silver has been on a slow and steady rise for most of the spring also saw a bump following the Brexit vote. When the London Silver Fix closed at $17.29 on June 23, this was already a $3.29 increase (23.5-percent) from the January 4 first close of 2016 price of $14.00. After the results were announced, London Silver Fix closed at $18.04, a 4.3-percent increase. With the London Silver Fix closing at $20.14 on July 15 (16.48-percent increase), some pundits are suggesting that silver will continue to outperform gold for the near future. 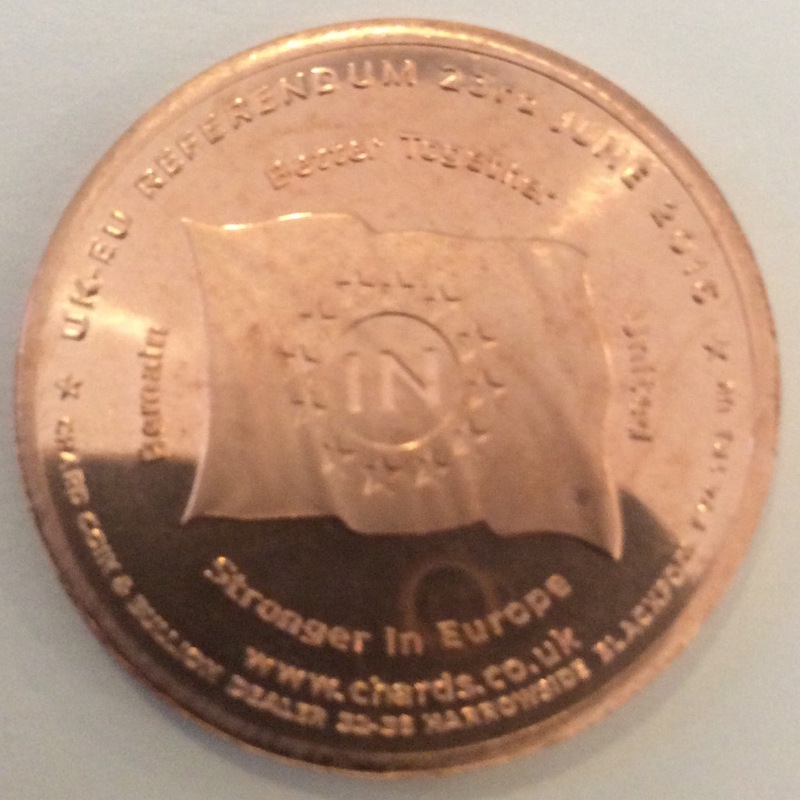 When I wrote about Brexit, I also mentioned the “In/Out UK EU Referendum Medallion” produced by Chard(1964), a British metals dealer. After the post, the folks at Chard saw a small bump in sales from collectors the United States from a few of my readers. I was not paid to mention the medal. I just found the information online and thought it was an interesting idea. Shortly before the vote, someone at Chard contacted me and offered to send me some medals. After a swim across the pond, the medals arrived in my physical mail last weekend. Even though I thought Brexit was a bad idea, the medals are still very cool. Design is the same on both medals. One is copper and the other is Abyssinian Gold, a type of brass made of 90-percent copper and 10-percent zinc that has a gold-like color. Medals are 31mm in diameter and weighs 14 grams making it a nice sized coin for flipping. Chard sent two sets of the medals. I will keep one set and donate the other to my coin club’s annual auction whose proceeds will benefit the Scouts and other numismatic-related education in our region. 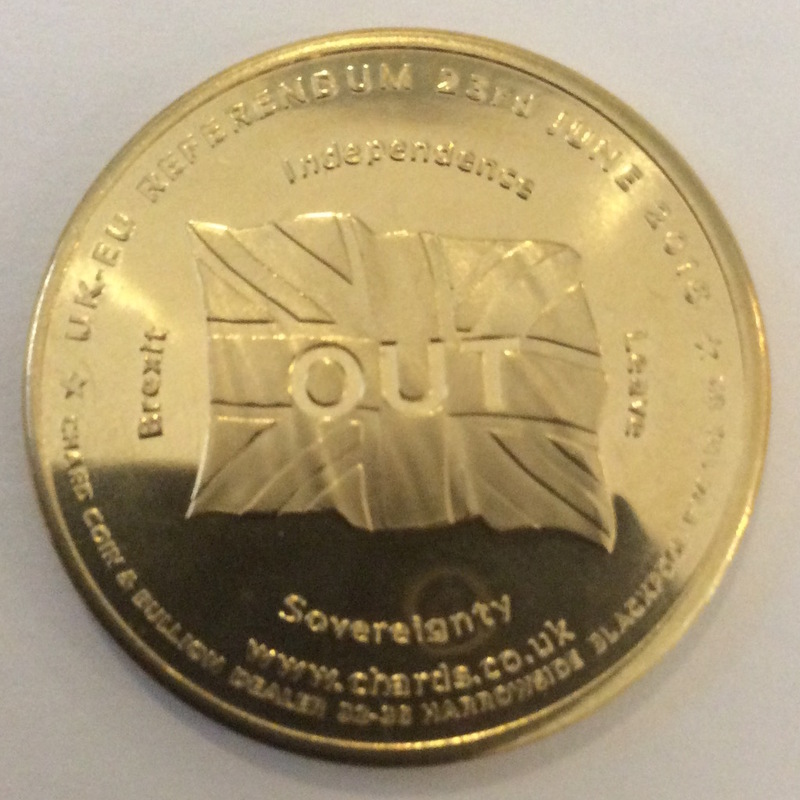 It appears that these medals can still be purchased for £2.95 each ($4.33 at the current exchange rate) plus shipping (estimated at £6.00 or $8.80) directly from Chard’s website. I am not making money from this endorsement. I just think it’s a fun collectible! Static charts courtesy of Kitco. 1902 Panama 2½ Centesimos on the left. On the right is a national brand coated aspirin. Alex: It’s the smallest coin struck by the U.S. Mint. Johnny: What is the dime? Alice: What is the penny? Alex: Sorry, that’s not it either. Pat, do you want to guess? Pat: What is the gold dollar coin? Weighing in at 1.25 grams, containing .900 silver (1.125 grams of silver), and measuring 10 millimeters in diameter, the coin nicknamed the Panama Pill is smaller than the silver three-cent piece, which was 14 millimeters in diameter, and the small gold dollar (Type 1) that was produced from 1849 through 1886. The gold dollar weighed 1.67 grams and was 15 millimeters in diameter. Although there are smaller coins, such as the 9.09 millimeter Maximillian coin struck by the Mexico City Mint, this is the smallest ever produced by the U.S. Mint. After Panama gained its independence in 1904, the new government made the decision to convert its monetary systems from the Columbian peso the balboa. Named in honor of the Spanish explorer Vasco Nunez de Balboa, the balboa would be subdivided into 100 centesimos to use for commerce. But Panama faced a similar problem that the United States faced over 100 years earlier. Since commerce was based on the Spanish Milled Dollar, which was 8 Reales, it was common for the coinage to be divided by 8 rather than 10. Simply, if something cost 1 Reale, referred to as 1 bit for when the milled dollar was physically cut for smaller denominations, a direct conversion would mean that an equivalent to the bit would be 12½ centesimos. The United States solved this problem by striking the half-cent coin. Panama opted to strike a 2½ centesimos coin that would be paired with the 5, 10, 25, and 50 centesimos coins, all produced by the U.S. Mint. Rather than continually produce these coins until the bureaucracy caught up with commerce as was the case in the United States, Panama ordered 400,000 of these coins. The Panamanian people adapted to the new currency system, making this a one-year type coin. During our monthly coin club meeting some members bring coins and boxes of foreign coins for other members to pick though. I went to the table where a member brought a box of loose foreign coins and someone found the Panama Pill in the box. Having never seen one before, when the searcher passed on the coin, I took the opportunity to purchase it. 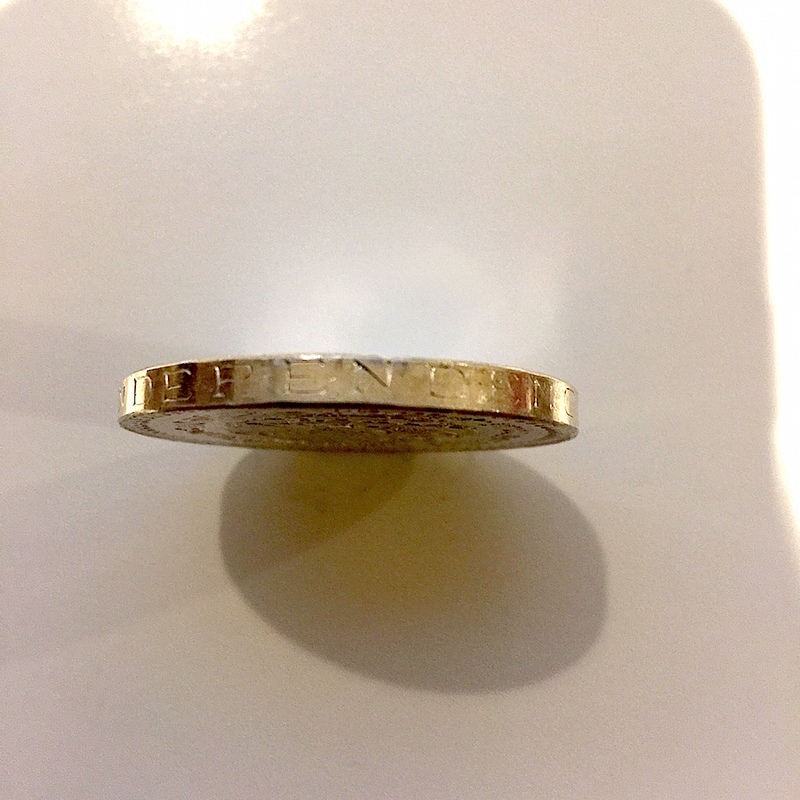 Just for fun, I searched for the next smallest coin in the box. This found a 1963 Sweden 10 ore coin. It is 50-percent larger than the Panama Pill at 15 millimeters but is only slightly heavier at 1.4 grams. The difference is that the Pill was made of silver and the 10 ore is copper-nickel. Having time to search a box of foreign coins can be a lot of fun. Things you read about in history books, read in the newspapers years ago, and nice designs can be found on many foreign coins. Even though the Eurozone uses a common currency with a country specific reverse, there is nothing like some of the coins that the individual countries produced before creating a common currency. In that light, our top story of the night, Generalissimo Francisco Franco is still dead. Will Greece create new numismatic collectibles? The debt crisis in Greece and their threat to drop the Euro as the unit of currency reminded me that this would present an interesting collectible opportunity. Collecting numismatic items from distressed times can present an interesting challenge. While we have heard about Hard Times Tokens being a popular collectible, sales tax tokens produced during the Great Depression so that people could pay the exact fractions of a tax on low-value purchases. Two of the more recent examples of numismatics based on distressed economic conditions are the Zimbabwe hyperinflation currency and the State of California’s Registered Warrants (IOUs). Although both have different origins from the Greek crisis, both show different ways of handling the situation. When a country controls its own currency, it can manage that currency to maintain its value. In the United States, that is done by the Federal Reserve. It uses many programs from buying debt from its member banks to setting what it calls the Discount Rate, the rate that its member banks can borrow overnight to meet its liquidity requirements. In Zimbabwe, the central bank did not have the business and circulation in order to make this type of policy work because of the strife caused by wars and other ugliness. Their only choice was the print more money. The more money printed, the less it is worth. The less the money is worth the more it takes to buy daily goods and services. This result is that the more money that is added to the economy the higher inflation goes. Zimbabwe gave us the hyper-inflated currency ranging from Z$10 to Z$100 trillion. It has become fun to own a note that makes you a billionaire or a trillionaire even though the actual value of the currency is worth less than the paper which it is printer. Since Zimbabwe has converted their system to the U.S. dollar, Zimbabweans will be converting the old inflation currency at the rate of Z$175 quadrillion (175,000,000,000,000,000) for US$5. An enterprising Zimbabwean could buy them for double and make more money selling the notes as souvenirs than converting them to U.S. dollars. California was a different story. It was a self-made crisis of politics in 2009 between the Republican Governor Arnold Schwarzenegger and the Democratic-controlled legislature. Since neither side could agree on a budget, Schwarzenegger declared a fiscal emergency and ordered the printing of IOUs to pay for state debts. Officially called Registered Warrants, the first of these IOUs were issued to pay personal tax refunds. They carried a 3.75-percent interest rate and were redeemable when the budget was passed or in early October, which ever came first. The crisis was averted when Schwarzenegger signed the budget on September 3 and redemption began on September 4. California State Comptroller’s Office stopped redeeming warrants as of November 10, 2010. A friend who was living in California at the time was issued an IOU for a small personal tax refund. Rather than be burdened with the rigors of cashing the warrant, the paper is now part of his collection. However, since the warrants were addressed to specific people, it is not likely that these items will be immediately collectible. Many years from now it is probable that these warrants will be a curious collectible like the old Series E or War Bonds. 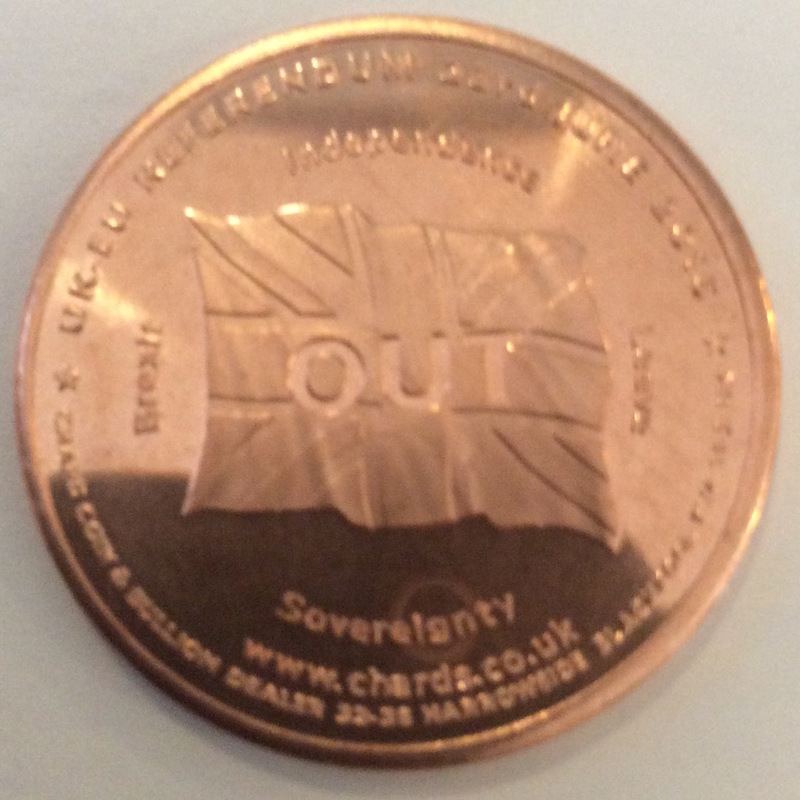 Greece does not control its own currency nor does it have any potential backing to issue warrants. Since Greece has not been seen as creditworthy, it cannot issue bonds at any interest rate because the markets are not interesting in buying Greek debt. Unless a deal can be struck with the rest of the European Union, Greece may not have a choice but exit the pact that uses the Euro as the common currency. Exiting the Euro will bring back the Greek drachma. 2000 Greece 20 Drachma coin features Dionysios Solomos, a poet and author of the Greek national anthem. The return of the drachma would create three numismatic collectibles. One would be the Euro coins with the Greece-specific reverse, whatever the Greek government issues in the interim, and then the new drachma. This would not apply to euro currency since each denomination uses the same design throughout of the Eurozone. Before you search your ten pound bag of foreign coins looking for pre-Euro drachma, it is likely that Greece will keep those coins demonetized and not recognize them as official currency. If Greece wants to be able to control the amount of currency in circulation, then they will have to issue new coins and notes. If Greece goes this route, experts are saying that the Greek government will allow the Euro to circulate alongside whatever is added to the market. Some people think it may take over a year to strike enough coins and print enough notes to be able to remove the Euro from circulation. What will Greece do in the interim? Does the Greece Central Bank issue warrants like California did? If so, will the warrants become something that would become a collectible? Greek 1€ coin courtesy of EuroCoins.co.uk. Zimbabwe $100 trillion note courtesy of Wikimedia Commons. 20 drachma coin courtesy of Numista. 10,000 drachma note courtesy of the Bank of Greece. Have you ever started looking for something only to find other items that are more interesting that what you were looking for? The Saint Petersburg Mint is the oldest mint in Russia. Founded by Peter the Great in 1724, it was the primary producer of coins and currency up until the formation of the Russian Federation and adoption of their current constitution in 1993. The main mint facility is now located in Moscow. Peter the Great founded Saint Petersburg in 1703 and made it the imperial capital of the Russian empire. Wanting it the to be the most modern city in the world, Peter was proactive in making sure that innovations in infrastructure and cultural life would be available for everyone in the capital. His efforts were fought by the nobility who thought they would lose their power if the government gave more to the people. Peter died in February 1725 from a massive internal infection without realizing many of his dreams for the city. Following Peter I’s death, Peter’s second wife Catherine I and grandson Peter II, were crowed as tsar of the Russian empire. In 1738, following Catherine’s death in 1737, Peter moved the capital to Moscow but leaving many of the infrastructure behind. Peter II died in 1730 and was succeed by Anna, who was the daughter of Ivan V and niece of Peter I. Anna had been raised with full royal flourishes and chose to move the capital back to Saint Petersburg in 1732 and continue Peter’s westernization efforts for her own pleasure. The era following Peter I saw the decline of the Russian empire including the degradation of Saint Petersburg as one of the world’s most cosmopolitan city. It wasn’t until the age of Russian Enlightenment under Catherine the Great when there would be improvements in Russian society and the great Mint. The Russian Enlightenment was the inspiration for Charles Gascoigne to abandon his career as a lead engineer in the steel mills of Edinburg, Scotland and move to Saint Petersburg in 1786. In Saint Petersburg, Gascoigne de a name for himself as an engineer, inventor, and successful businessman. One of his specialties was to take failing businesses and use his engineering skills to modernize their production. One of the businesses Gascoigne turned around was a button foundry whose owner submitted medals made by the machinery to Catherine in order to win a contract to produce more. Catherine died in 1796 and her son, Paul I was coronated as emperor. Paul was impressed with the details created by the machinery that he was more interested in hiring Gascoigne to update the old minting equipment. Gascoigne first sent engineers to perform the tasks but later took over the projects himself when it was discovered that the machinery being used was in severe disrepair. In 1798 he was assigned the task of determining what it will take to rehabilitate the old Mont. When Gascoigne did his assessment, he found the entire facility in such disrepair that he proposed a full refurbishing of the facility including buying new machines to coin money. Gascoigne’s plan was to clear everything out of the building and rebuild the floors and walls leaving the outside alone. This included purchasing new equipment and creating new facilities to store and process metals. His plan also included ways to refortify the building that had be subject to thefts. In 1799, Paul issued an imperial degree to allow Gascoigne to execute his plan. Unfortunately, Gascoigne was caught over charging the Russian bank for materials and was briefly arrested in late 1799. Claiming it was a misunderstanding, a Russian court fined him the amount allegedly overcharged and was allowed to return to the Mint to finish the work. Gascoigne handed over the management of the mint to the Banking Yard Mint Office Department so that he could concentrate on finishing the reconstruction. Work was finally completed in October 1805 and was handed over the Assignation Bank, who occupied the Mint building. Founded by Catherine the Great, the Assignation Bank was the manager of the money supply in imperial Russia. The Saint Petersburg Mint survived changes in bank rules in 1843 when the Assignation Bank was dissolved as part of financial reform and the Assignation ruble was recalled and replaced with state credit notes issued by the newly created State Bank. It continued to be the primary producer of coins following the Russian Revolution of 1917 when all of the paper note production was moved out of Saint Petersburg (renamed Leningrad) primarily to Moscow. Starting in 1961, the Leningrad Mint began to strike commemorative and bullion coins for public sale, primarily to foreign collectors and investors. Although it was the primary mint for creating medals during the existence of the Soviet Union, much of the circulating production was being moved to other facilities within the country. As part of the economic reforms that ended communist rule and formed the Russian Federation, all production of circulating coins were moved to other facilities leaving the Leningrad Mint the country’s producer of medals and collector coins. As part of the reformation, government offices were consolidated in the capital city of Moscow removing the Mint’s standing as the country’s primary facility. The Leningrad Mint, became a subsidiary facility as part of this reorganization. And with the vote by city residents to rename the city in 1991, it was renamed the Saint Petersburg Mint.